Little Roseveth is ideally situated to visit all of Cornwall. We have numerous wonderful gardens, beaches cliff walks and other tourist and historical attractions, just a short drive from the property. 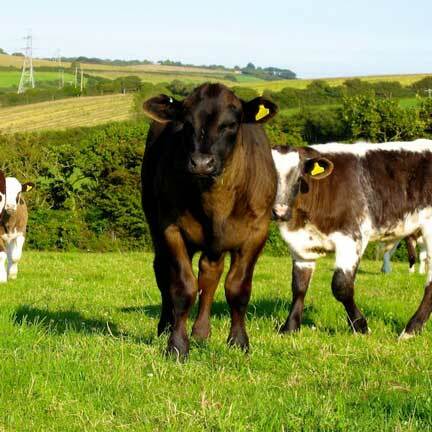 Right in the centre of Cornwall – just 3 minutes from the A30, we sit on a 40 acre smallholding, keeping beef cattle, pigs and chickens – all living the outdoor life! We recommend using Google Maps to find us, which has an accurate location for us. Just type “little roseveth” into the search or click here. For those without a smartphone, There are three ways to get here depending on the direction that you come from. Don’t worry, we’re easy to find – follow one of the directions below or check out the Map. Travelling west on the A30 from Indian Queens… At the roundabout joining the A30 with the A39 (with large windmills) follow the A30, onto the Zelah bypass. Continue for 1.5 miles passing the Town and Country Nissan Garage on your right. Take the next left, signposted Allet. At the next junction turn right, away from Truro on the B3284. In 300 yards take a left turn signposted Roseworthy. Drive for one mile to the next junction, that is a green triangle of grass with a small Chestnut tree in the middle. Bare right off that junction and to your left you will see a road that has a “no through road sign” on the left and Little Roseveth on a slate sign, on a raised granite flower bed. Take this lane down through the white gate, past a pond on the right, up into the yard. The bed and breakfast wing is straight in front of you. From Chiverton Roundabout, follow the A30 over Fourburrows Hill, descending on to road with a central reservation (Chy Bucca). Turn right towards Truro on B3284. Travell for approximately one mile. Do not take the first right to Tregavethan, take the second right turn to Roseworthy. Drive for one mile to the next junction, that is a green triangle of grass with a small Chestnut tree in the middle. Bare right off that junction and to your left you will see a road that has a “no through road sign” on the left and Little Roseveth on a slate sign, on a raised granite flower bed. Take this lane down through the white gate, past a pond on the right, up into the yard. The bed and breakfast wing is straight in front of you. These directions are from the Tesco Superstore, which is a well known and obvious location – just off of the main roundabout on the Morlaix avenue ring road (A39). Coming out of Tesco car park, head right on Newham road and take the third exit on the main roundabout. Continue on the A39 until the next roundabout where you will take the first exit, past Helfords. Continue on this road (B3284) up the hill, straight over the mini roundabout and heading out of Truro. Keep on this road for roughly 10 minutes then turn left onto School hill, signposted Roseworthy and Boscolla (just before The Old Plough Inn). Drive for around 1/3 of a mile until there is a right fork, take this right and continue on this road past Penrose Kitchens round a sharp right bend. When you reach the top of the hill, theres is a green triangle of grass with a small Chestnut tree in the middle. Bear left at this and to your left you will see a road that has a “no through road sign” on the left and Little Roseveth on a slate sign, on a raised granite flower bed. Take this lane down through the white gate, past a pond on the right, up into the yard. The bed and breakfast wing is straight in front of you. Coming by Train or Plane? The nearest airport is Newquay Airport (20 minutes drive), and the nearest train station is Truro Station (5 minutes drive). From either of these locations, you would need to hire a car or get a taxi to Little Roseveth. If you’re coming from Newquay Airport, turn right onto the A30 and follow the ‘From the East’ directions.